[Sir Thomas Phillipps of Middle Hill, eccentric book and manuscript collector, complains of having been 'plundered' by a Worcester lawyer.] Autograph Letter Signed ('Thos Phillipps') to the wife of Sir Charles Hastings, in reply to an invitation. 3pp, 16mo. On bifolium. In fair condition, lightly aged. Phillipps's letter (or draft letter) is a reply to a dinner invitation from the wife of the eminent Worcester physician Sir Charles Hastings. It occupies the reverse of the first leaf, and both sides of the second leaf of the bifolium. The recto of the first leaf carries the invitation, in manuscript, with the text in square brackets printed in copperplate: 'Sir Charles & Lady Hastings [Request the pleasure of] Sir Thos & Lady Phillipps' [Company at Dinner] on Thursday the 28th. Inst. [Sir Charles Hastings, eminent surgeon, angers Sir Thomas Phillipps.] 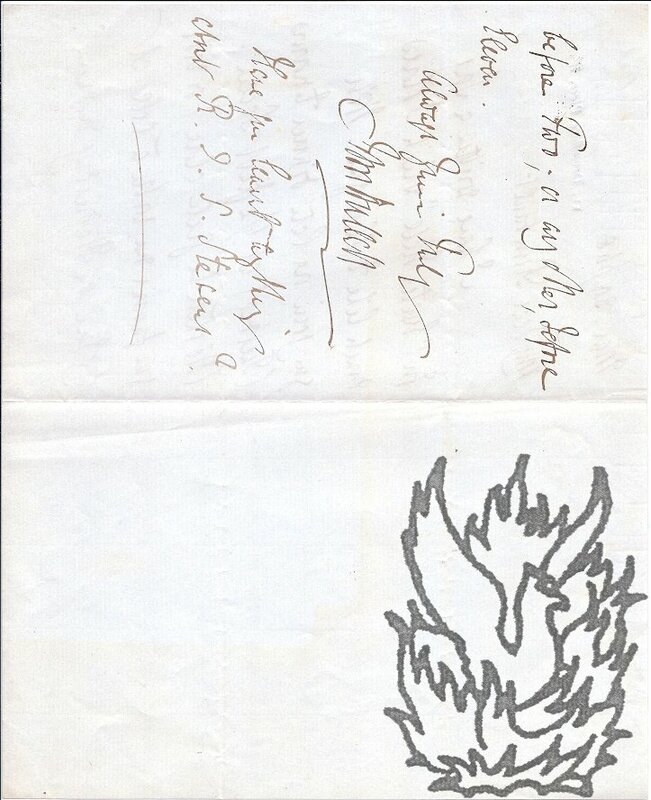 Two Autograph Letters Signed to Sir Thomas Phillipps, regarding the Worcestershire Natural History Society, with Signed Autograph Draft of reply by Phillipps. Both from Worcester. 25 and 29 January 1846. Draft of Phillipps' reply dated 31 January 1846. Both letters in good condition, lightly aged. Both bifoliums, and both signed 'Charles Hastings'. ONE: 25 January 1846. 4pp, 12mo. He is 'glad to hear' that Phillipps is thinking of 'coming down to one of our evening meetings at the Natural History Society' (Hastings being the chairman). The date for the next meeting will be fixed on the following day, and Hastings' son, who is a member of the committee, will communicate with Phillipps. 'Our last meeting went off very well. [ Worcester Quarter Sessions, 1895. ] Printed item signed and annotated by Sir Richard Harington: 'A Calendar of Prisoners, for trial at the Easter Quarter Sessions of the Peace'. 'To be held At the County Hall, Worcester, on Monday, the 8th day of April, 1895.' Printed by Deighton and Co., High Street, Worcester. pp., 4to. Aged and worn pamphlet, with rusted staples. The title-page states that the cases are heard 'Before John William Willis Bund, Esq., Chairman, and Richard Holmden Amphlett, Esq., Vice-Chairman.' 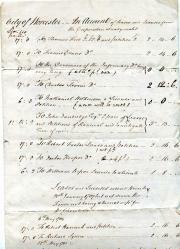 The calendar consists of a table of fifteen prisioners, over four double-pages, with entries divided into fifteen columns, giving name of prisoner, age, trade, 'Degree of Instruction', details of committing magistrate, date of warrant, date of receipt into custody, details of 'Offence as charged in the Commitment'. [ George Young, Shrewsbury Quaker land surveyor. ] Coloured manuscript map on vellum of 'Lands at the Holly Bush and the Dales in the Chapelry of Knightwick and County of Worcester Belonging to Isabella Hodges'. On one side of a 58 x 39 cm. piece of vellum. In fair condition, rolled, and lightly aged and worn. An finished production, with elegant lettering and compass. Maps showing the lands – which adjoin those of Lord Foley – at the Holly Bush to the left side, and those at the Dales to the right. 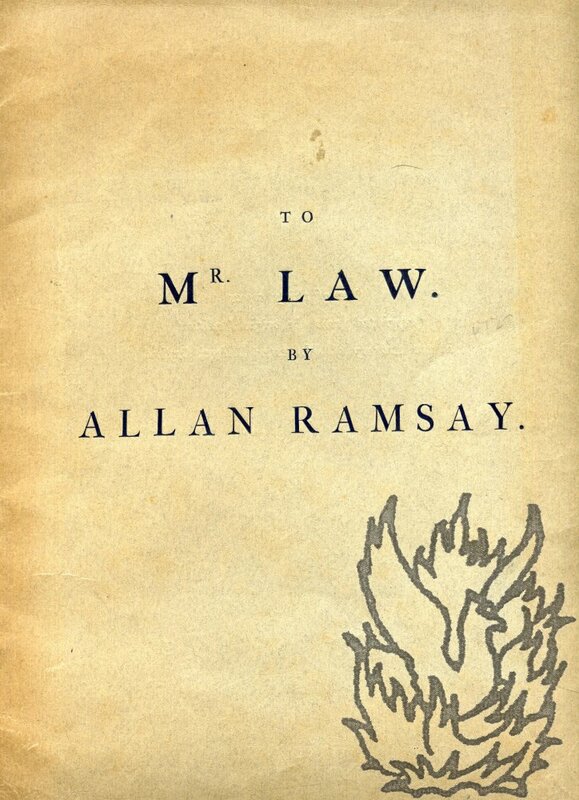 Title in the middle of the page, beneath which is a table of 24 locations, from 'Far Meadow' to 'Orly Spring', colour coded to the two parts of the map: 'Green | Yellow | Red | Blue | Sea Green'. The table quantifies the amount of 'Arable | Pasture | Orchards | Hop Yards | Coppice', with totals. [ A Herefordshire Murder Case, 1891. ] Manuscript copy of a report by 'E. 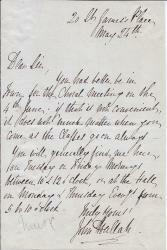 Marriott Cooke', addressed to Sir A. K. Stephenson, Solicitor to the Treasury, on 'the mental condition of Charles Sanders', accused of the murder of Walter Steers, infant. Worcester County and City Asylum, Powick near Worcester. 3 December 1891. The case to which the present item refers is the subject of Chapter 16 of Nicola Sly's 'Herefordshire Murders' (2010). The trial of Charles Sanders for the wilful murder of the thirty-two month-old Walter Steers, before Mr Justice Day, opened at the Herefordshire Winter Assizes on 3 December 1891. He was found guilty and hanged at the end of the month. The present item is from the papers of Sanders defence barrister, Richard Harington (the future 12th Baronet, of Ridlington), whose 'impassioned speech in favour of his client' was not enough to save him from the gallows. To be held at the County Hall, Worcester, on Monday, the 19th day of October, 1896. Printed by Deighton and Co., High Street, Worcester. + 19pp., 4to. Unbound and stapled. In fair condition, on aged paper with rusted staples. The calendar is divided into fourteen columns (the last five blank), and gives details of name of prisoner, age, trade, 'Degree of Instruction', details of committing magistrate, date of warrant, date of receipt into custody, details of 'Offence as charged in the Commitment'. It provides an interesting insight into social history. 4pp., 12mo. Bifolium. Aged and worn, with short closed tears at head of both leaves. He is 'extremely concerned to hear that Mrs Harington & her children are insufficiently provided for', and while he would be happy to unite with her friends 'in any direct effort on her behalf', as far as obtaining an apartment at Hampton Court for her is concerned he is 'powerless', it being in the gift of the queen. 'Col. [ Stuart family of Castlemilk and Torrance. ] Manuscript: 'Torrance Library | Copy List of Books forwarded to Sir Richard Harington | June 1916'. [ Torrance, Lanarkshire, Scotland. ] June 1916. 6pp., folio. On two bifoliums held together with pink ribbon. Folded into a packet and docketed. 56 books are listed, with author's names and dates of publication, and details of presentations and inscriptions, such as 'B P Stuart - Charlotte Stuart - The Gift of Robt. Harington' and 'Memo in Rob Harington's Handwriting'. Includes works in English, French and Italian, the earliest being Wright's 'Rutland', 1684 ('B P. Stuart of T. | Marianne Harrington [sic] 1834') and the latest O. M. Mitchell's 'Orbs of Heaven', 1853 ('R Harington'). From the Harington family papers. 2pp., folio. On single leaf, with the reverse paginated 2. In double column. The article begins: 'No sign of the times appears to us fraught with more emphatic warning than the proposal of Dr. Pusey, that the Universities should abandon subscription to the Thirty-nine Articles, as the practical qualifications for orthodox Church of England Protestant teaching.' A footnote cites a work by Macbride. Booklet: [The De Quincey Society, Worcester College, Oxford.] Art & Stationery Co., Printers, Oxford. Revised, 1894. Menu: Worcester College, Oxford. 'High Table - 18 June 1905'. Both items in good condition, on lightly-aged paper. Booklet: 8pp., 32mo. Staples rusting. Cover with Worcester College crest printed in red. Pp.3-6 carry the 20 rules, and p.7 contains a list, in three columns, of 46 'Members of the Society since its foundation. ', from F. E. C. Drew to W. T. Lancaster. Menu: on small rectangle of card, headed with 'Menu' and the college crest printed in blue. At the head of the card, in pencil: 'High Table - 18 June 1905'. The menu is written out in another hand, in blue ink: 'Boiled Turbot | Poulet a la Marengo. Kromeskys. | Roast Sirloin of Beef. 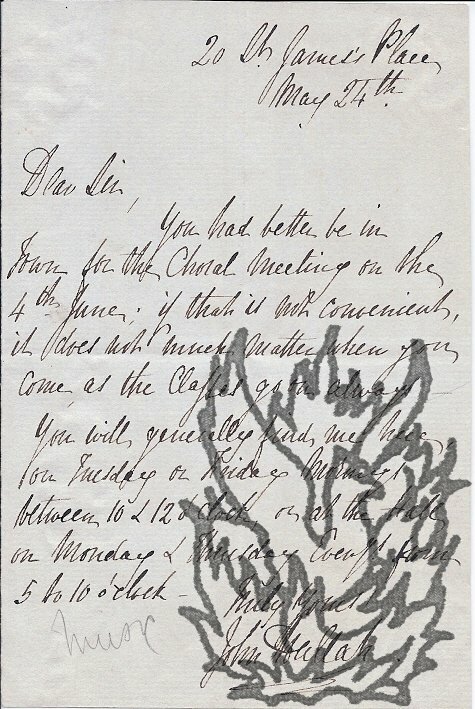 Autograph Letter Signed ('H H Milman') from Henry Hart Milman, later Dean of St Paul's Cathedral, to Francis Cohen [later Sir Francis Palgrave], discussing his poem 'The Martyr of Antioch', the Rev. James Garbett and Milton's Adam and Eve. St Mary's, Reading. 11 April 1822. 3pp., 4to. Bifolium. Addressed, on reverse of second leaf, to 'Francis Cohen Esq | King's Bench Walk | Temple | London'. Fair, on aged paper, with the narrow remains of a paper windowpane mount around the edges of the second leaf. Milman begins: 'I found Garbett so much occupied that until yesterday I have not had an opportunity of seeing him'. Garbett has promised to send Milman 'a detailed answer' to all of Cohen's questions, 'and is very much flattered by your favorable opinion'. Autograph Letter Signed ('B Price') from Bonamy Price, Drummond Professor of Political Economy at Oxford University, to 'My dear General' at Yale, following an 'American journey'. 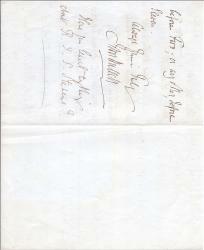 2 March 1875; on letterhead of 2 Norham Gardens, Oxford. 4 pp, 12mo. Bifolium. 63 lines. Text clear and complete. Good, on lightly-aged paper. Difficult hand. He thanks him for 'the Statistical Tables', admitting with 'some shame' that he needs 'an interpreter for part of the tables on page 68'. Describes the problem in detail, and discusses 'the sly remark that "the change is being made quite as abruptly as would be safe". 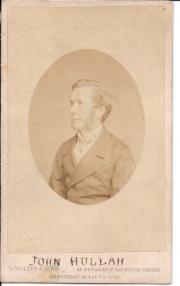 Photographic portrait by Messrs W. Walker & Sons of Cavendish Square, London, of the English composer John Pyke Hullah, on albumen carte-de-visite. Undated (circa 1860?). Messrs Walker & Sons, Artists & Photographers, 64 Margaret Street, Cavendish Square, London. Oval sepia photograph of the head and shoulders of Hullah, looking to his right in double-breasted jacket. Faded and on aged card, with traces of mount adhering to reverse. 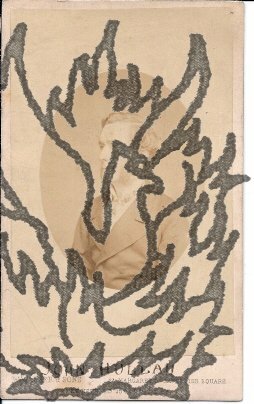 The sitter - who by comparison with other photographs is definitely Hullah - is named as 'JOHN HULLAH' in a contemporary hand on the card beneath the laid-down photograph, and as 'Mr Hullah' in pencil on the reverse. Not present in the collection of the National Portrait Gallery, which only holds three images of the composer. Manuscript document headed 'City of Worcester - An Account of Leases and Licenses from the Corporation already sealed'. 8vo, 4 pp. Bifolium. Text clear and complete. Fair, on lightly-aged paper, with slight wear to extremities. First three pages, with forty entries, beginning with 'To Thomas Ford 2l. 12s. 6d. and petition 2gs'. All entries with 'Stamps & parchms.' in left-hand column and 'Licenses from' in right-hand column. Subheading after nine entries reads 'Leases and Licenses ordered prior to 28th. 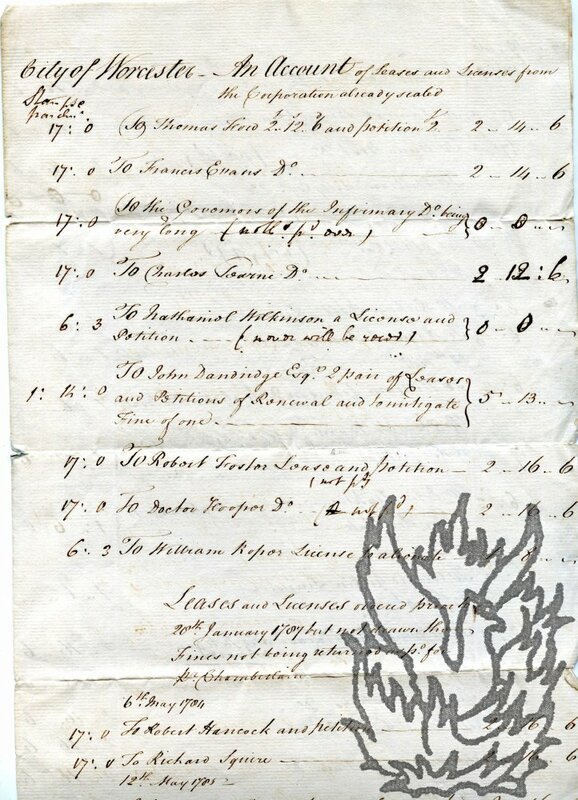 January 1787 but not drawn the Fines not being returned as po. for Pr. Chamberlain'. All columns totalled at end. Docketed on last pager, with signature of 'Richd. Observations on the Nature and the Treatment of the Asiatic Cholera. 8vo, lxxii + 499 pp. In original embossed brown cloth, gilt, with wear to hinges. Binders ticket of Remnant and Edmonds, London. 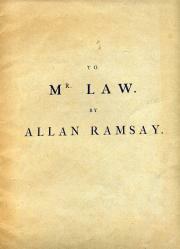 A tight copy, on lightly-aged and foxed paper, in fair binding with wear to hinges. Inscribed at head of title: 'Presented - | To George F. Knipe Esqre. with Dr. Turley's Compts | 1854 -'. (There are references to Turley on pp. vi and 41 of the book. Turley and Knipe were provincial surgeons of relative proximity: Knipe at Stratford-upon-Avon and Turley at Worcester. On a piece of paper roughly 3.5 x 9 cm, with embossed details of stationers. Good, with tiny crease to one corner. A clear signature, in pencil.